This post doesn't have a thing to do with bikes but it serves to highlight the everyday commitment to recycling and the environment here in Scandinavia. IKEA of Denmark think differently, as we have seen, and Swedish McDonalds do, too. 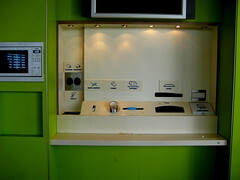 This McDonalds places the recycling task into the hands of the trained Swedish recycler. When you're done eating you sort your garbage into the appropriate slots. When I first tried it, it took 48 minutes for me to figure it out. But watching the locals do it and you see it is really second nature. Slots for cans, bottles, straws and lids, foot leftovers, drink/ice leftovers, cardboard boxes, cups and the trays. Click on the photo to go to Flickr and see the notes on the photo and to get a better idea of how it works. Another fine detail which we don't even have in Denmark is when you buy a Happy Meal for the rugrats you get fries AND a choice of carrots or apple slices. In Denmark the kid can choose between fries OR carrots or apple slices. What kid is EVER going to let the fries go? But whenever my boy gets fries AND carrots/apples, he always eats the healthy stuff. This was the same McDonalds I've blogged about before, with the bike racks outside.